Before you sit down with your potential photographer, first make sure they have your date available — if the answer is no, there is no need to schedule an in-person interview. But if they do have your date available, meet for an interview or schedule a telephone interview. 1. Will a contract of the services be provided? If so, can I get a copy? There are a lot of studios that don’t create contracts for their wedding photography clients. You should require a contract from your photographer that details what services they will be providing, pricing, termination resolution terms, etc. Contracts are created for your protection and for the studio as well. 2. How many other events will you photograph that day? I highly discourage booking with a studio that will do more than one wedding on your wedding day. Most of the times, resources have to be shared among the weddings from the equipment to the people and at the end of the day, the attention to detail and to the client suffers in such circumstances. 3. Will you be my actual photographer or will it be one of your associates? This is one of the most important questions to ask a wedding photographer. Do not assume that the person you are talking to is the one who will come to shoot your wedding because if you’re interviewing a photographer from a bigger company, it might not be him who is coming to cover your wedding. So make sure you talk to the actual person coming on your wedding and you request to see work he has actually shot himself to avoid surprises. 4. What if you get sick or an emergency comes up and you can’t photograph my wedding? This is one of those uncomfortable questions for a wedding photographer, but is super-important. If you’re going with a company that employs a team of photographers, you’ll have a built-in backup. A photographer who works alone should have a good back-up plan in case of emergency, one that makes you feel comfortable and secure. 5. Have you ever photographed a wedding at my venue before? If the answer is yes, ask to see the images that were shot at your venue to make sure they match with your vision. If the answer is no, it’s certainly not a deal-breaker, but see if the photographer would be willing to “scout” or check out your location in advance of the wedding to pick backdrops, etc. 6. How many photographers will cover my wedding? Will you have a second shooter or assistant? Well this one also depends with the size of your wedding, and sometimes if it’s a small wedding, one photographer will be sufficient. And think about this, there is no way one photographer could picture your kiss and at the same time turn around to capture your mum or dad crying. 7. How would you describe your style of photography and can I see examples? How would you describe your wedding photography style? You will likely hear words like Photojournalistic, Traditional or Artistic etc. but usually these words mean different things to different people so it’s best if you can ask them to show you their portfolio to have a better understanding and see if you like it. 8. How long after the wedding do we get to see the photos? Find out how long it will take for your photographer to finish working on your images. About three to four weeks is pretty much the standard depending with the wedding season for most photographers. Also, find out how you will receive the images to avoid surprises. 9. How many hours of coverage do we get? What is the charge for overtime? Knowing up front the photographers policy on overages is critical. Is there an additional charge in the event that the wedding ends after the expected time? Because if overtime is going to cost you a ton, you want to be able to plan their hours accordingly. 10. Can I see the full album from a wedding? Some photographers will just show you a collection of their best images, instead of the full set of images from a wedding, start to finish. You’ll want to see images from every part of a wedding — getting ready, the ceremony, first dance, etc. — not just the most creative or dreamy portraits. For most photographers it’s a deposit usually half of the total cost and a signed contract. For some it’s full payment, for some it’s just a signed contract and the date is yours. 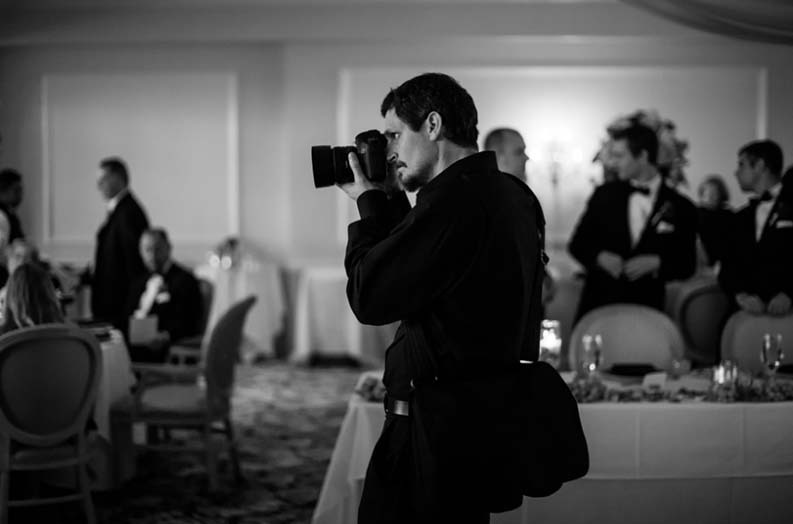 Even though the wedding photographers are a big part of the wedding day, it’s important that they are not distractions. As such, it’s important for the photographer to blend in as much as possible. Furthermore, for religious or cultural ceremonies, there may be certain colours that are considered taboo. Make sure your photographers will be dressed appropriately for the occasion. There are many more questions that you may want to ask your potential photographer but this is a good start.